Athletes MUST check in at our registration tables at RIM PARK at 4pm. You will be assigned an Athlete ID-Number upon registration which will be used to track your results. You will also be told which event # you will start at. Please wear shorts, t-shirts and cleats. At 4:50pm there will be a quick meeting with all athletes to explain the 5 Combine events and how they will run. Players who are late or who do not check in will not be able to participate. The combine will start at 5pm. Participants will be grouped with their age divisions. Each athlete is responsible to check in with the data recorder volunteer at each event station to confirm that their stats are gathered correctly and recorded. Upon completion of circuit, athletes will then proceed to the skills portion. Upon arrival at the skills station, athletes will report into the designated holding area where they will be provided instructions from the coach on what skills/drills are being conducted. We will have a wrap up meeting (including PIZZA for everyone!) 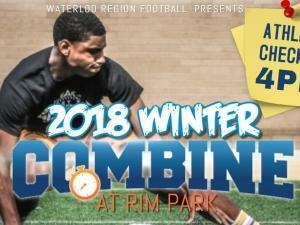 after the combine upstairs in Room 207-208 at 7pm. There will be giveaways handed out to ALL participants. Awards will be presented to the 1st Place winners in each individual event per age division as well as Overall MVP per age division.